Join Us!!! We are looking for someone to help us cover Namibian basketball. Please send us an e-mail. The annually held IBF 3x3 Young Lions Cup will be held again this weekend to determine a winner who will go on to represent the country in Botswana. Regions from all around the country will all gather at the Katutura Youth Sports Complex,Basketball Artists School, to play it out for gold! The tournament is for u18 division teams who already held preliminary games in their respective regions to pick a male and/or female team to play the other regions. In collaboration with NNOC, DOSB, FRESH FM and OTB, may the best team win! The Namibian Basketball Federation in Walvis Bay opened its second high performance center on 21 June. 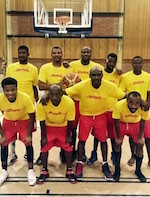 Under guidance of coach Sylvester Goraseb and Namibian Basketball Federation's German expert Frank Albin, a selected group of 12 young talents started working on their fundamentals. During the following weeks, the players and local coaches are supposed to follow the practice plan given by Namibia Basketball Federation which shall guarantee that all selected players achieve a minimum skill level. The first high-performance centre was established in April in Tsumeb and the players have been making a lot of progress since then. Soon after its opening, the high-performance centre in Walvis Bay hosted a mini basketball event in honour of the Olympic Day. Around 50 players, coaches and teachers from various primary schools took part. The boys and girls learned the basics of dribbling, passing and shooting; harnessing their new horned skills in various contests and games. DHL Titans became 2016 champions. In the Final series they beat the Lions 3-1 in the KBA 2016 league finals. They grabbed the win at the UNAM gym hall. After being tied at 1-1, DHL Titans posted another two victories to clinch the title. Earlier in the Semifinals DHL Titans overcame the Wolves.